Highest attendance for the Saloon Stocks was 38 cars on the 13th August (European Superstox day), the Superstox achieved 27 cars at the same event. The Hot Rods had a 20 car attendance for the Open Scottish Championship on the 7th May. Note no official points available therefore points totals from personal records. Note no official publication of roof grading colours. Gordon McDougall had disclosed to Gwen that it was his ambition to be the National Points Champion for 1978. He then started the season brilliantly & by the time of the Open Scottish Championship on April the 9th he had won the previous 3 finals and had accumulated a 19 points lead. The Open Scottish race itself had the track suitably soaked prior to the race with a very heavy shower of rain. 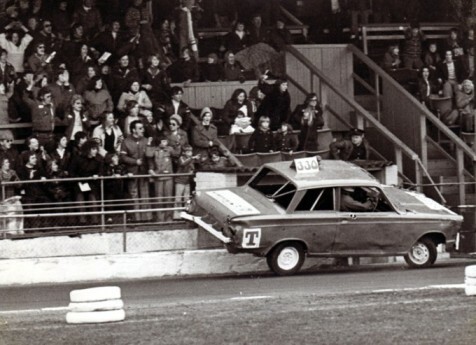 In fact the Stock Car season so far had been blighted by bad weather. Though the opening meeting could be described as "bright & cold", the following were described by my good wife as follows:- "damp", "pouring rain", "heavy rain", & "thick fog & rain". So bearing in mind Gordon's recent form in these conditions, the heavy rain just prior to the Open Scottish race undoubtedly brought a smile to his face. True to this form Gordon won the race at a canter, half a lap in front of Englishman John Gray & reigning Scottish Champ Vic Russell. The promotion had come in for a fair bit of criticism for having too many red tops in the Superstox, the quantity was thus reduced to 5 at the 2nd grading period. 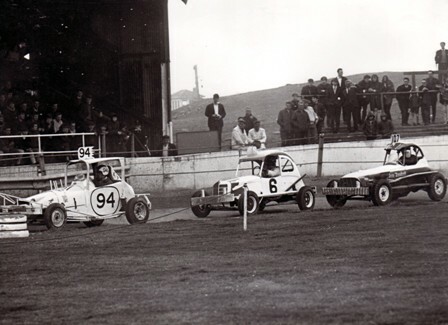 In late May Bill Pullar made a successful crossing to Ireland during the Friday & Saturday racing he collected a 1st & 2nd in his heats and went on to win the final at Ballymena. Bill still turned up to race at Cowdenbeath on the Sunday, but his points total fell 8 short of the 27 points collected in Ireland. Only the highest total points in a one week period would count in the National Points Chart. A large crowd of 8000 arrived to see if Vic Russell could make it 3 Scottish Championships in a row. It was not to be however, Gordon McDougall won both heats so was looking a fair bet for the top honours. It was Ian Edmiston though who won the championship making this Ian's most successful season by far, Bill Pullar snatched 2nd & Vic's defence of his title still netted him a creditable 3rd. 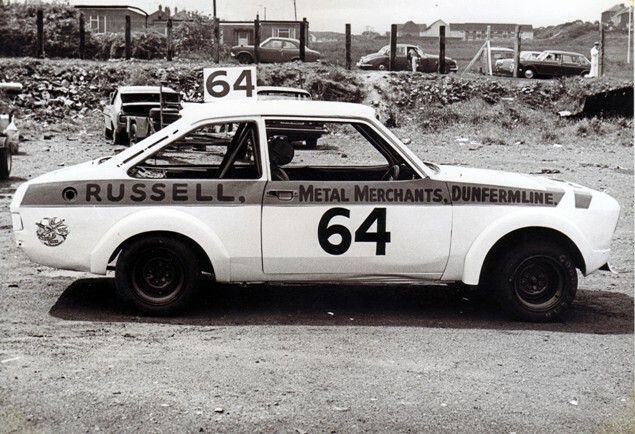 Vic Russell attained a creditable away result with a 5th in the British, Howard Cole being the winner. Scotland's most prestigious event of the year came around on the 13th August the Superstox European Championship. English driver Steve Monk was the defending champion from 1976, the race not being contested in 77. Steve had experienced a lot of bad luck recently when his new house had burned down, this had curtailed his racing somewhat, however he made the long trip to Cowdenbeath determined to defend his title. Steve was one of the true greats in Superstox racing, he was the first to hold World (1974), British (1975), European (1976) & English (1978), that being the big four titles for English drivers. The draw delivered Neil Bee a front row grid position, bad luck continued for Steve however with a spot right at the back. Ex World Champ Bee raced off into the lead, Bill Pullar quickly moved into 2nd. 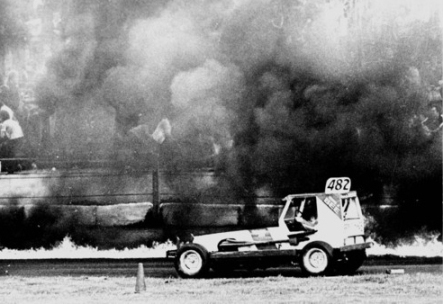 With only 10 laps gone a spectacular event occurred when Les Clark's car started leaking petrol, a passing car set the petrol alight and about 30 metres of track was ablaze. A few cars performed circus acts by driving through the flames, before the race was halted. Bill Pullar had managed to pass Neil prior to the stoppage, and he led away from the re-start, and was never again headed, Neil Bee collected 2nd & Gordon McDougall 3rd. Sunday 10th September 1978, was indeed a bitter sweet day in the history of Scottish Stock Car Racing.The crowd were solemn as an announcement was made that two of Spedeworth Scotland's officials had been killed in an air crash in Rhodesia, Clerk of the Course Walter Brown and his wife Bunty. Despite a large field of Saloon Stocks delivering plenty of fast crunching action, the spectators mood was still restrained. At the interval however news came through from Kaldenkirchen in Germany that Gordon McDougall had regained the World Championship title, a massive round of highly charged emotional applause spontaineously ensued even although the recipient wasn't there to receive it. Reighning British Champ Howard Cole was 2nd & Neil Bee 3rd. Walter started our decade review to date having finished 2nd in the National Points Championship of 1969 to Malcolm Paterson. 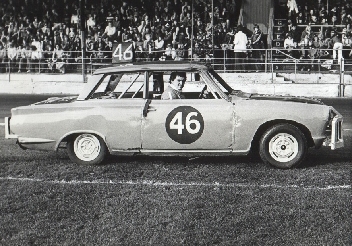 However Walter's career started many years before having been one of the original British Stock Car Drivers Association representatives that joined Spedeworth Scotland. I am not sure of an exact date when Walter started, I hope to accumulate more information on Stock Cars Racing's early years in the months to come. I can say however that in the 1963 Scottish Formula 2 programme for White City, Glasgow, that it was noted that Walter was the current holder of the most race wins at White City - that being 7 which included 2 Finals. 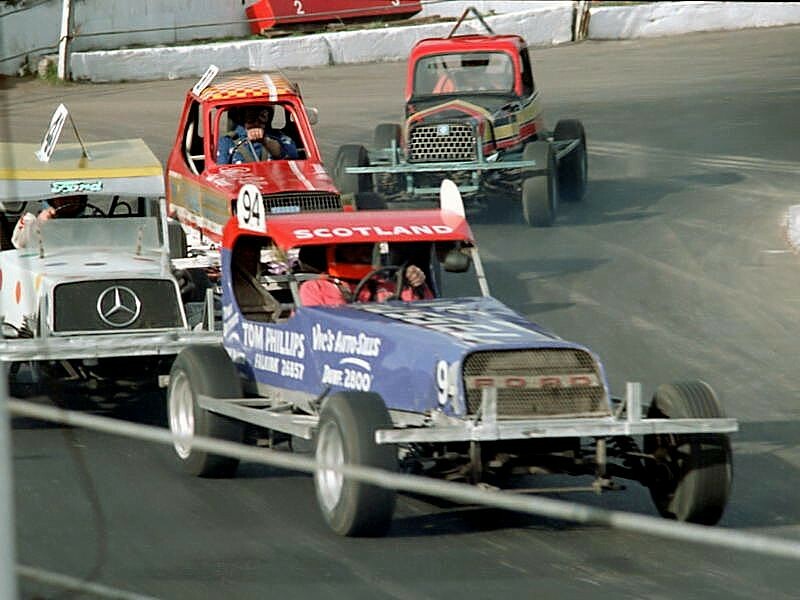 Out of the 47 drivers who were booked in for the Scottish Championship meeting, only 5 drivers were listed as red tops, Bill McLeod, Les Clark, Albert Wardle, George MacMillan (Senior Senior) and Walter Brown. Walter had stated that one of the biggest influences on him was watching Johnny King at Belle Vue, but his favourite drivers were two of his main competitors Malcolm Paterson & Tennant Douglas. During his period of racing with Spedeworth Scotland there was no greater supporter than Walter, there was a period from Spedeworths inception in 1965 through to 1972 when Walter raced at every single Spedeworth Scotland meeting - bar none! I list below the information I have accrued to date on Walter's career, this will be added to as more information is obtained. Newly crowned World Champion Gordon McDougall received a rapturous standing ovation from the 5000 stock car fans when he went on his lap of honour prior to the commencement of the racing on the 17th September. Unfortunately in the days racing he was brought down to earth very quickly as it was blue top Mike Jack who made a clean sweep of the days races, winning the final by half a lap! This brought Mike's success to 7 out of the last 9 races at Cowdenbeath! The last international event of the year was the UK Challenge Cup on the 1st of October, three times previous World Champion Dave Pearce won the race for England , the first time since 1971 that the title had gone to England. 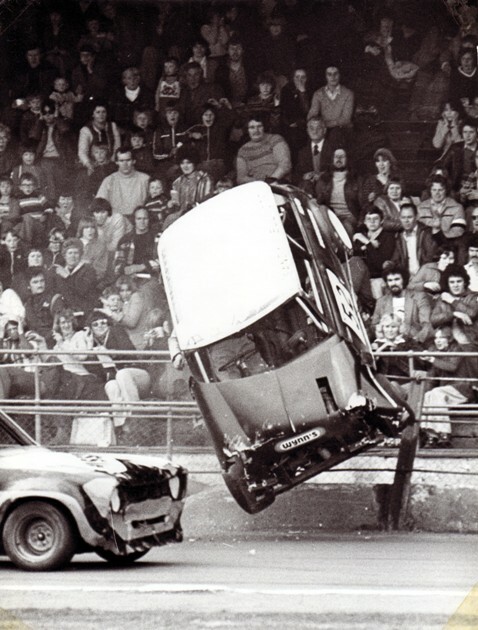 A couple of stoppages during the race for bad accidents, John Gray got carted off to hospital in the first, & Roy Eaton destroyed his car in the 2nd though was not injured. Howard Cole grabbed 2nd & Bill Pullar 3rd. It had been possible for Bill Pullar to catch Gordon McDougall in the last meeting if Gordon had a disastrous meeting and Bill a dream. As it was Gordon finished one place ahead of Bill in each race to collect the coveted title - just as Gordon had predicted to Gwen at the first meeting of the season. NOTE no official records available points are therefore from personal records. No records of where roof colour change. On the 13th August a Scottish Stock Car great scored his last points at Cowdenbeath under the number 118. 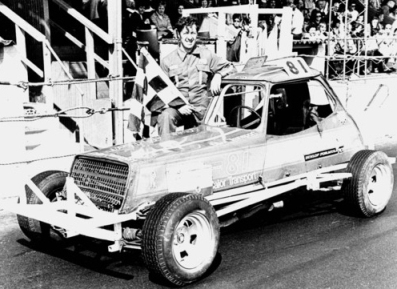 Johnny Davidson commenced his Stock Car Career in 1970, won the Scottish National Points in 71, he also finished in 7th in the British Championship at Wimbledon that year. The points win in 71 came when the competition for points was fierce with no less than 102 drivers scoring points, & points were only awarded to the top five finishers. 6th in his debut season, 3rd in 72 & 73, 5th in his comeback season to Saloon Stocks in 75 & 3rd in his last complete season of 76. Johnny had a go at Hot Rods in 1974, winning 4 heats & finishing the season as a blue roof. Johnny's racing had been curtailed for some time due to his business keeping him out of the country for a great deal of the time, however he had an impressive record of Saloon Stock race wins, at least 34 finals & 64 heats. I say at least because Johnny was very successful at Armadale, his home town, and I am missing a few results from that track. Johnny always seemed to collect the runner up spot in the major championships. Though he did win the East of Scotland in 1975, he may also have won a West of Scotland - to be confirmed. This sounds like a roundup of Johnny's career, however it was not the end, the re-opening of Aramdale did tempt him back in 1980, but under the new number 108. The "Never To Be Repeated" UK Challenge Shield for Saloon Stock Cars - was - & occurred on the 21st May. There had been a huge demand from English Saloon Stock car drivers for a booking, and indeed it was a powerful force of English drivers that came north to try and avenge the previous years rout. Another large crowd of 9000 fans turned up for the action. (I have to say based on previous published crowd figures, it looked a lot more to me). Revenge did not take place where it mattered though, the irrepressible Bob Jones negotiated the carnage to retain the title. 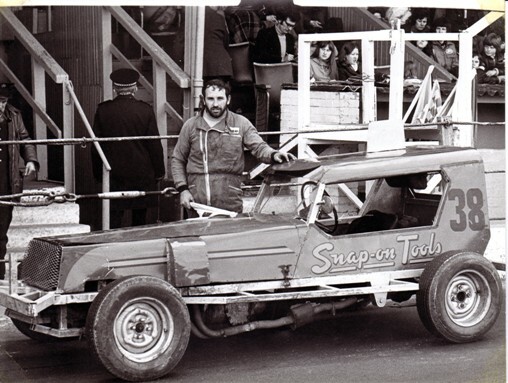 (Has there ever been a better Scottish Saloon Stock Car driver at reading races?). English pride was partly restored with excellent 2nd and 3rd places from Brian Sayers & Eddie George respectively. The other heats were won by Bob Jones and England's Conrad Self. Charlie Milne collected himself the final. The home fans were ecstatic at Conrad's heat win, so a few decided they should let Conrad sample some of the home fair on his lap of honour - in the shape of traditional mutton pies! Our race commentator John Kelly, as I stated previously didn't approve of this event in 77 & described the pie throwing incident in his race report as the throwing of "missiles"! 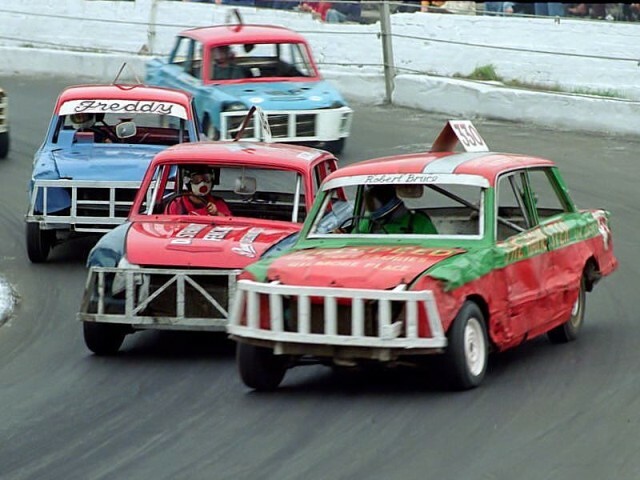 In subsequent meetings at Ipswich, villains (Scottish & English) were often presented with empty beer cans as gifts if they happened to find themselves in the fence at the wrong point on the track as Dean Wood & John Maxwell would testify. 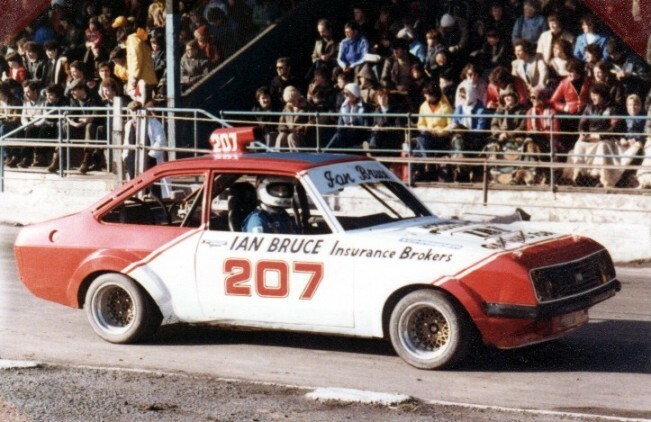 Another big crowd of 7000 fans witnessed Keith Jarman winning the Scottish Saloon Stock Championship, his father Howie one of the pioneers in the formula in Scotland won the same event in 1974. Keith was still only 22 years old at the time and there were plenty more successes to come. Keith made a clean sweep of the meeting by taking both heats as well. 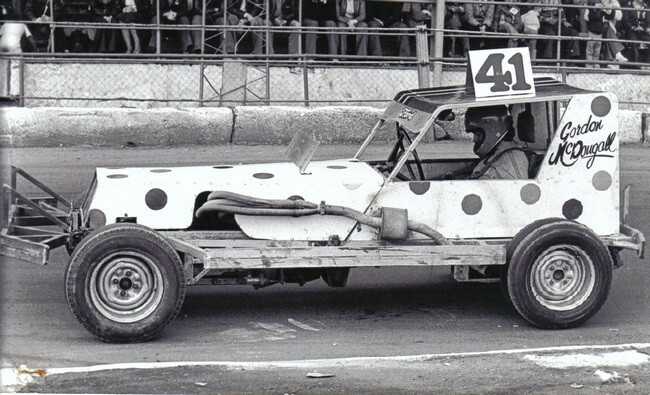 At the Ipswich Spedeweekend in the National Saloon Stock Championship, Robert Bruce & Keith Jarman started 44th & 45th in the 45 car field and raced through to 2nd & 3rd, they could not quite catch Englishman Dave Olding. But it sure did raise the spirits of the Scottish contingent in the crowd. Towards the end of the season a few meetings had been run where the Saloon Stocks were divided into 3 heats, instead of the traditional 2 all in, that ran previously. This usually resulted in around 20 car heats, the downside was that the races became more uneventful, indeed one of the heats on the 8th October had only 12 starters. Thankfully the practise was soon discontinued. Robert Bruce collected his 4th National Points title in a row, a magnificent feat, remember his main competitors this year were Keith Jarman, Bob Jones, Charlie Milne, not to mention other speed merchants such as Jimmy Blair & John Gilchrist. NOTE no official records available, points are therefore from personal records. No records of where roof colour changes. Ex Saloon Stock drivers Tommy Davidson & Dougie Farrer made the move into the Hot Rods. Dougie made the better fist of this by far, in taking 9th in points, 1 final & 3 heats. The NHRPA instigated a Grand Prix Series in 1978, although Spedeworth Scotland were a member of the NHRPA, it was decided that Cowdenbeath was not of a design that could handle 25 Hot Rods. Though Ian Bruce did join the circuit in 1979, thereby increasing the interest in the series in Scotland. Barry Lee won the inaugural championship. 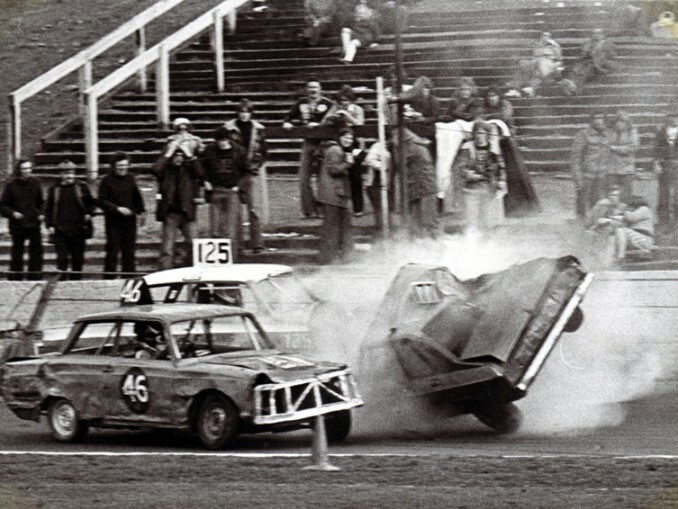 There were a couple of spectacular incidents at the 23rd April meeting, Sandy Elliot executed a spectacular roll in his Hot Rod Mini along the home straight, and John Gilchrist crashed (pictured in the Saloon Stock section) on the back straight severely damaging his car. The Open Scottish Hot Rod event came around in early May. The promotion's persistence with Hot Rods, was continually rewarded at these "big" meetings with large turnouts of spectators. Aided by some "warm" weather 9000 fans packed into the Cowdenbeath Raceway. The home fans were kept happy when the event developed into a close battle between Kenny Ireland & Les Kay. 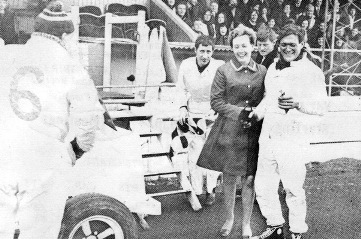 Kenny had managed to take up the lead position but was disastrously taken out by lady English driver June Tomlinson when she pulled out of the race just as Kenny was passing her. Les took over the lead wining from Duffy Collard and Pete Stevens. The Scottish representatives for the Hot Rod World Championship for 1978 were to be the current top points scorers at the time, this was an alteration from previous years where the participants were decided through qualifying meetings. This revised method of qualification was lobbied for by the drivers. However the promoters advised that the previous method would be reverted to in future. Their logic was that the drivers in "current good form" would qualify. Unfortunately the reality was that Scotland's best drivers regularly failed to qualify for this event due to mechanical gremlins - accidents etc. The fairest method & best method was undoubtedly utilising the top points scorers. It is acknowledged though that the qualifying meetings method resulted in promotional opportunities and were no doubt exciting albeit often disappointing from a spectator point of view. Kenny Ireland became the one and only driver to win Scottish Championships in Saloon Stocks, Superstox & Hot Rods, when he won the Hot Rod title in May. Dougie Farrer demonstrated that his move to Hot Rods was serious coming through for second, Les Kay got the remaining podium. 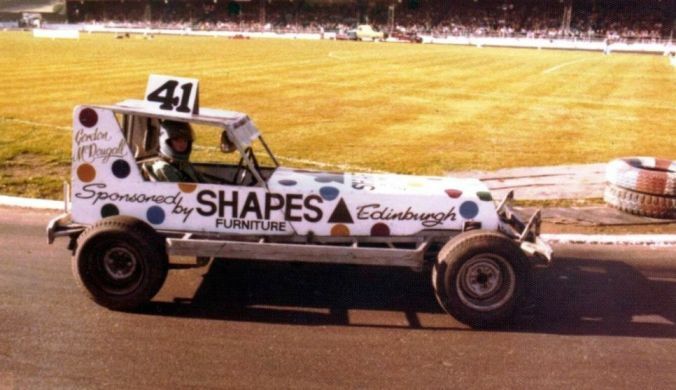 While Kenny might not be Scotland's greatest ever Stock Car Racer he is a definite candidate as Scotland's greatest Oval Racer. Les Kay & Kenny Ireland were Scotland's representatives in the National Championship at Hednesford, Les managed to blow his engine in practise & Kenny was also out of luck in the racing. The East of Scotland Championships in late July produced two surprise winners in the shape of Allan Ross in the Saloon Stocks & Alex Grant in the Hot Rods, in fact Alex only qualified for the championship race itself through finishing dead set last several laps down in one of the heats! Gordon McDougall was a predictable winner in the Superstox - after all it was pouring with rain for that particular event. The hosting of the British Hot Rod Championship was best described as mayhem! A large crowd of 8000 arrived for the event, despite the absence of such luminaries as Barry Lee, Duffy Collard & George Polley. First man out of the hat in the draw was Kenny Ireland, Ormonde Christie was next. Ormonde was piloting his Triumph Spitfire bodied car at the time and the start of the race was delayed somewhat by last minute repairs to his clutch cable. As well as first man out of the hat, Kenny was first man out of the race, his newly replaced engine blowing on the 2nd lap. The lead then changed between Ormonde, local driver George Barrie and Pete Stevens. At one point while Ormonde was in the lead he appeared to be deliberately baulked by Colin Facey while being lapped, for which Colin received an immediate black flag. Stevens went into the lead but Christie gradually fought back through not seemingly entirely legitimately., but a lot of boring and barging had been let go already in the race, so I guess it seemed petty to start dishing out penalties now. Hamish Buchanan had been going great guns and was right on Ormonde's tail. Ormonde skilfully held on, Hamish collected 2nd and Pete Stevens limped home in 3rd - No other cars finished out of the original starters. Cowdenbeaths reputation as a Hot Rod track was certainly increasing, but not for the right reasons! Driver Ian Bruce returned to the Hot Rods after a 5 year layoff (supposedly banned for life, Ian was not the only Hot Rod driver to survive "banned for life "decisions). His car was a beautifully presented RS 2000, While zipping into the lead in each race he had to make do with a 4th & 5th place. However after a 3rd place in the following meetings first heat, he went on to win the Final, taking little time then in getting back to his old form. The points championship in the Hot Rods was to go down to the final race of the season, between Les Kay & Graham Wait. Les had taken over the lead in the points chase from Graham on the 6th August and had held on to the lead until October 8th when Graham went back in front. Les reduced the deficit at the penultimate meeting, he could have regained the lead if he had settled for a place behind George Barrie in the final. Les got passed George maybe not entirely legitimately, certainly George thought that and came back at Les very forcibly resulting in the retirement of both cars. The final meeting of the season saw Graham with a 4 point lead. 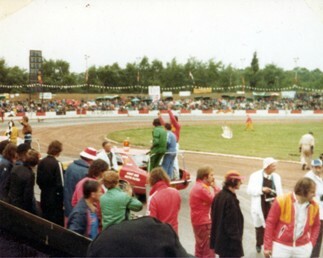 The first heat produced a controversial incident when Graham spun Les out after he passed him. Maybe this is where Michael Schumacher picked up his racing disciplines when going for championships! As a result of the collision, fittingly, Graham collected a puncture and retired, whilst Les rejoined the race and collected 3rd spot. The protagonists were now on equal points. In the next heat Les finished 2nd & Graham 4th. The scenario was then that Graham had to finish ahead of Les in the final to win the points. Les drove a supremely cool and confident race while Graham looked to be on manic pills as he oversteered understeered, two wheeled, hit the wall, but could still not find a way through. Thus Les regained the National Points Championship.